CARBONDALE, I.L. 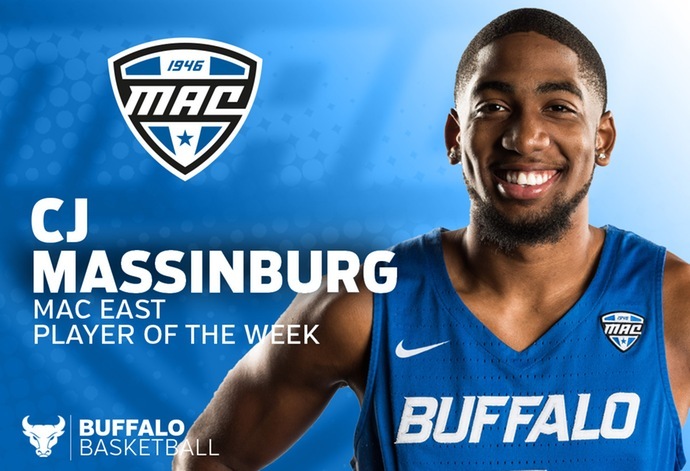 -- Coming off a career night in Buffalo's win over nationally-ranked West Virginia, UB senior guard CJ Massinburg has been named the MAC East Player of the Week, the Mid-American Conference announced on Monday morning. 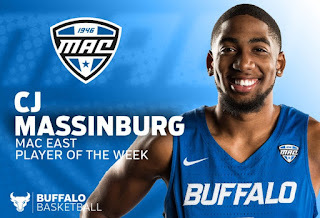 Massinburg started his final season off with a bang as he averaged 27.0 points and 11.0 rebounds in UB's two victories this past week, including a huge upset at #13 West Virginia. In the win over the Mountaineers, Massinburg exploded for 43 points, the second most in school history and the most ever by a Buffalo player in a road game. Massinburg drilled nine three-pointers in the game, the third most for a UB player in school history. Massinburg became the first player to score 40 or more points against West Virginia since Kansas standout Andrew Wiggins in 2014. In addition, he added 14 rebounds as he became just the eighth player in college basket since 2010 to have over 40 points and at least 14 rebounds in a game. With his 54 points through the first two games, Massinburg also moved up to seventh place on UB's all-time scoring list. Massinburg has received his share of national recognition following the weekend, including being named the national Player of the Week by Andy Katz and NCAA.com. Massinburg and the Bulls remain on the road Monday night as they face Southern Illinois in another early season test. Tipoff is at 8:00pm EST and it will air on ESPN+.